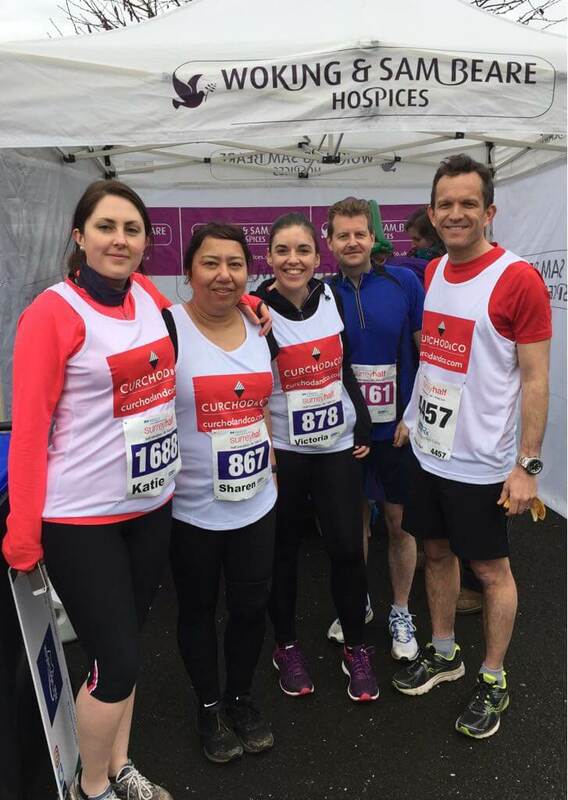 Curchod & Co goes the extra mile for local hospices | Curchod & Co.
A team of Curchod & Co’s finest athletes completed the Mercer Surrey Half Marathon on Sunday 11 March, raising over £1,000 for the Woking and Sam Beare Hospices. Five runners from Curchod & Co’s four offices in Woking, Weybridge, Camberley and Farnham, of varying abilities from a complete running virgin to seasoned veterans, completed the 13.1-mile course. The race began at Woking Leisure Centre and took the runners through scenic countryside and the villages surrounding Woking and Guildford. The team was made up of Curchod & Co partner, Nick Reeve, surveyors Katie Hemblade and Gary Whitaker, property manager Victoria Powers and the firm’s head of accounts, Sharen Meade. Nick, Gary and Victoria set their own personal best times for the distance.